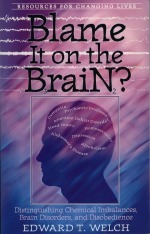 Blame it on the Brain is a book that stands out in the sea of “self-help” resources. Even when you scour most Christian counseling books, you are hard-pressed to find such candid descriptions of our sin and grace. While this constant focus on each human being’s sin could be bothersome to some, I believe it offers more hope than any other approach. It is not enough to explain away our struggles, problems and addictions by blaming our genetic makeup or our environment. While these things certainly play a part in our life, they are not the cause - and merely provide an opportunity to reveal what is deeply in our heart. If we believe our biggest problem is a biological one, we will look to medicine for relief. If we think that our environment is the biggest problem, we will place our hope in re-orienting our lifestyles and situations in life. However, neither of these are reliable solutions. Only Jesus and the righteousness He offers provides rock solid hope for us - because only Jesus can deal with our sin. Medicine certainly cannot cure sin, and behavior modification or a change in life situation cannot either. Blame it on the Brain is extremely gospel-centered, and it seeks to apply the gospel to some of the most difficult struggles that plague human beings. It is the gospel-centered, theologically rich foundation which makes Blame it on the Brain most helpful. The Doctrines of Grace are all throughout this book, most notably the doctrine of total depravity. The conviction that every part of our being is affected by sin is something that will influence the way we view counseling, addictions and healing. The problem runs deep - deeper than modern psychologists would even venture. The typical psychologist may dig below the surface in an attempt to discover past hurts and influences; they might even try to uncover a “sub-conscience” of sorts, but they are not looking in the right place for the roots of our problems. The roots stem from the sin that is in every one of us. This is both bad news and good news. It is bad news because it means that we cannot fix the problem. Our best human wisdom, education, science and medicine can only put a topical salve on the deep wound in our soul. But this will not heal us from the inside out. That is where the good news comes in. Literally. The gospel is good news - the good news that Jesus came to heal the brokenhearted and set the captives free! There are numerous aspects to Welch’s book that I benefited from. One such aspect is the tenor in which the book is written. While the book does a thorough job of exposing the sin that each person might be struggling with, it does so in a gracious spirit. Biological factors such as chemical imbalances and mental deficiencies are not discounted or trivialized, but rather they are put in the proper perspective. I feel that Ed Welch wrote this book with a tender, pastoral spirit which I believe puts down the guards that people might put up when challenged to evaluate their heart and confess sin. I especially appreciated this spirit since I have family members who have struggled with mental health issues and I have sought to love them yet speak truth into their life. Another aspect that I loved about Blame it on the Brain is the clarity that it brought to some of the struggles that we often hear about and interact with. I have always assumed that medical professionals truly have found a specific chemical imbalance for those who struggle with depression or ADHD, but in reality we are still not sure which chemical it is that we need to compensate for, which causes me to understand medicine a little differently. It would seem (or at least many give the impression) that we know which chemical is wanting, and a simple medicine will replace that chemical. However, as Welch describes in the book it is not quite that simple. Medicine does often work, but not always, and not because we have a tidy formula worked out. We know that God uses medicine to heal, but it reminds us not to put our confidence in anything other than His gracious hand. Another thing I haven’t considered too much before reading this book is the role of suffering in our life on account of a health infirmity. As I was reading this book, I injured myself playing soccer and tore my ACL and meniscus. All of a sudden, the truths about how God may want to use suffering became ultra clear to me. I have been prescribed medicine to cope with the pain, and I do take advantage of those helps, but I am reminded that whether or not they relieve the pain (and they haven’t much), God wants to use this injury and the pain involved to draw me closer to Jesus. The ultimate goal is not to find the right meds to be pain-free, but rather the ultimate goal is glorifying God by loving Jesus through this small suffering. In fact, Welch argues that medicine should not be the first thing we run to when we are dealing with mental or behavioral issues, because it could distract us from the issues of the heart that might need to come to the surface and be dealt with. Medicine can never resolve issues of the heart. This was extremely helpful for me to think about as I counsel people at church quite often who deal with these struggles. I believe this is very wise advice, and I plan on giving that advice as God allows me to continue to minister to those with depression, ADHD, and other such conditions. I really think the chapter on homosexuality was one of the most Biblical evaluations of this issue, and it is becoming increasingly more important for us as believers to know how we should respond to the issue. More than ever, we must allow our views and stances to be thoroughly drenched in Scripture and God’s truths. All around us there are many people, even Christians who are cowering when it comes to taking a position on what the Bible says about homosexuality. Compromise is in vogue, and Welch’s book does a good job of closing off that option. However, on the other end of the spectrum there are Christians who exude hatred towards those who struggle with the sin of homosexuality, and they even have the nerve to cloak this hatred in righteous indignation. Their pride is detrimental to what the church is called to, and I appreciated how Welch avoided any self-righteousness while at the same time calling a sin a sin. I have decided to consider the struggle of depression and apply the Biblical framework that Welch lays out in the book. The reason that I have decided to address the malady of depression is because it is near to my heart after having walked alongside of my brother Adam numerous times as he waded through these dark waters. It has been a debilitating struggle in his life over the years, and it has certainly been multifaceted and complex in nature. I have struggled to come up with easy answers, and while I believe most of my counsel and help was biblical, I will benefit from growing in my understanding of how to approach this issue with the gospel always in view. I believe Welch is correct when he says that most of our understanding of depression will come from actual interaction with a depressed person. I had read about and studied depression a little bit in Bible College, but nothing really prepared me to sit next to my brother and see the change in him. It was the visits to the psych ward with my Bible in hand, trembling because of my lack of pastoral ingenuity that caused me to sit and learn what depression can be like. When it comes to the two extremes of pain Welch mentions, my brother suffered from the extreme of emotional numbness. It seemed that he was a different person, unable to realize the extreme danger he was in. It was as if he thought it was completely normal to be in the psychiatric floor of a hospital hanging out with his other psychologically disturbed “friends”. It was extremely difficult to help him feel anything, although there were rare occasions where he would break down and become emotional if I spent time expressing my love and God’s love. One thing I did discover (and Welch mentioned) is that often the best thing I could do was just listen. I didn’t assume anything, but rather let Adam explain to me how he was feeling or not feeling. It was obvious to me though that something was definitely changing in my brother. I watched him go from a constant reader to someone who didn’t have the motivation to pick up a book. He was no longer the energetic conversationalist. Rather, he had become a hermit who just sat in his room most of the day with little to no words. I saw all this transpire and I tried my best to understand where Adam was coming from. Even though it didn’t make sense to me, I saw depression with eyes wide open as my brother wrestled with it. It really was my goal to understand Adam’s perspective as best as I could. There are no quick fixes. It takes time, prayer, and steady love towards someone who is struggling. Medicine can help stabilize an individual, but even that can cause additional problems. Depression is all-consuming for those who are struggling with it. There can be a complete lack of motivation to make wise choices. It is tough for those of us who have not experienced depression ourselves to grasp what the individual is going through. We feel as though somebody should be able to “snap out of it”. This was one of the things that I spent most of my energy on - trying to determine what was a physical, mental health issue, and what was a spiritual struggle. I must say that it is not always easy to differentiate. When it comes to my brother, there is no doubt that he tends to gravitate towards eccentric thinking and mental instability at times. This has been true ever since college. Some of the ways in which my brother thinks are different from what I am accustomed to, and could be described by some as OCD, or maybe neurotic. He has always thought about things in a deeper, different way - and so I have no doubt that comes to play in his depression. Combine this with occasional narcotics use, and you have a recipe for problems. Once my brother started using marijuana, his mental health took a turn for the worse. Abusing drugs aggravated his already fragile mental balance, causing him to have more severe bouts of discouragement, leading to full-out depression. What makes it worse (and sad) is that everyone else can see how using was detrimental to him except my brother himself. There is no doubt in my mind that some of my brother’s depression resulted from physical issues. And yet, it was just as clear to me that there were severe spiritual problems as well. Clearly, the use of narcotics was tied to a spiritual rebellion, but even more than that, there was a real battle going on inside my brother Adam, and it reared its head most prominently each time he had a bout with depression. It was the weirdest thing - every time Adam started to dig deeper spiritually, and evaluate the gospel of Jesus Christ, it was then that he would “go off the deep end”. It became apparent to me that Satan worked overtime when Adam started to soul-search. There was a war going on for my brother’s soul, and his faith was caught in the fray. As Welch highlights in the book, I became aware of the spiritual warfare that was surrounding my brother’s depression. Adam and I were raised in an Evangelical home, albeit a bit legalistic. Nonetheless, we were taught the truth of God’s Word from an early age, and he understood the Scriptures as well as anyone I knew. And yet, after exploring philosophy in college and then Eastern religions, Adam started to question much of the foundational truths of the Christian faith. He became pluralistic and believed in a universalism of sorts. And so, my brother’s soul is on the line. This is why I know that there are spiritual issues intermingled with his physical struggles. This is what it makes it real tough to decipher. Where the physical and spiritual issues meet or start and end is not always clear, and it can be overwhelming. But I do know that it has been my heart to address both with Adam. Both are important. Certainly the spiritual issues (lack of faith in the Scriptures and Jesus’ exclusive claims about Himself) are of the utmost importance. The last thing in the world that I want to see is Adam die and spend an eternity apart from my God and Savior Jesus Christ. And yet, the physical issues cannot be ignored either. There were times that Adam needed some amount of medicine to get him in a stable place, and keep him clear-headed so that spiritual issues could even be addressed. He has since taken himself off the medicine, which concerns all of us. I also have warned him numerous times about marijuana use as it hurts him physically. It can be difficult to know where to begin, and what problems are physical or spiritual. 1. Does the Bible command or prohibit this behavior? When I consider which of Adam’s behaviors are prohibited by Scripture, I can think of several - his use of narcotics which are illegal, his rejection of Jesus as the only way of salvation, his pursuit of godless philosophies and even (at times) blatantly demonic activities, just to name a few. Adam also has forsaken the local church, which is a clear-cut evidence of disobedience. All of these things have contributed to his spiritual confusion and even his depression. There are other things however that are not expressly prohibited by Scripture. His tendency to be a loner, his lack of drive in finding a career, his inability to have a romantic relationship (even though he desires one), his mood swings, and his obsessive compulsive tendencies cannot be addressed as sins per se, but they certainly have contributed to his emotional and mental health status. 2. Can this behavior best be described as a strength or weakness? Some of the things I mentioned above can definitely be described as weaknesses for Adam—his lack of drive to advance in life and be all that God has him to be is a weakness, and perhaps even a sin. Adam’s inability to give himself selflessly in a loving, romantic relationship may be a sign of the gift of singleness, but I doubt that when I talk to him and hear his strong desire to have a wife someday. This is a weakness that is perhaps also a sin. The rest, while weaknesses may not be explicit sins. Despite the fact that it can be difficult to differentiate between spiritual and physical needs, the next step can be accomplished all the same, beginning with the heart issues that are clearly evident. Beginning with the first time I visited my brother in his depression, I realized I needed to minister to my brother with love and compassion. His heart was bruised more than I realized, and I knew only the gospel could heal it. Sometimes I just sat there with him. Other times I read Scripture, and talked about whatever he wanted to talk about, just to be a companion. I have attempted not to be just the “pastor brother” who swoops in to fix him. I want him to always know I am his brother and friend first and foremost. This has been something I have had to learn—to walk patiently with Adam and love on him. Perhaps then the Scriptures I share will take root, and maybe my faith will be seen as valid as I address the issues of his heart. When it comes to ministering to my brother, the primary spiritual problems that I try to address are idolatry and disbelief. Adam struggles so much with letting go of the idols of intellectualism, philosophy, and “enlightened thinking”. I definitely believe these have become idols for him, and consequently massive barriers that prevent him from surrendering to the Lord completely. I have been discussing these barriers with him, and yet to this point he has not been willing to let go and completely destroy these idols. I am praying for him to do so. The other heart issue that is in the way is his disbelief. Adam struggles to accept all of the Scripture as inspired, and he is not convinced of certain fundamentals like a literal, eternal hell and the fact that God would judge those who have never heard the gospel. This is usually where our conversation ends up, and I don’t know what more to do than simply pray for the Holy Spirit to soften his heart and open his eyes so he will embrace these gospel truths fully. There are other spiritual problems that need to be addressed as well, such as church attendance. I have offered to attend a new church with my brother, since he has been disenchanted with the church we grew up in due to legalistic tendencies. I am praying and hoping he will take me up on the offer to attend a solid, Biblical, reformed, gospel-centered church. I have told Adam that he needs to continue to read the Scriptures and cry out for God to reveal Himself; yet he has given up this for the moment. However, he is getting ready to read Tim Keller’s Reason for God soon, and I hope he really does. Adam has only really had medical treatment during the few times he has been admitted to the hospital. After that, he gradually takes himself off medicine after a few months. I believe the longest he has stayed on his meds is 9 months. To be honest, when he tapers off of the medicine, he does just fine - until he begins to use illegal narcotics again. And so I continue to implore him not to do so. I am not sure, but there may be a seasonal correlation with my brother’s depression as well. I haven’t quite pinned it down yet, but I believe there are times of the year where he needs medicine more than others. While I don’t know a lot about medicine, and what he might need, I am not opposed to it, and there have certainly been times that it was absolutely needed. The couple times that my brother became unglued mentally, he needed to be sedated just to control him. And so I am thankful for how these medicines have helped him and perhaps even saved his life. My brother is doing well these days and is pretty stable; and yet, as the years go on, I am more convinced that nothing will fully heal my brother except for the powerful redemptive hand of God. And this is what I pray for most - that God would break through His stony heart and tear down those obstacles to his faith, revealing the beauty of Jesus Christ and the full gravity of my brother’s sin. We cannot blame my brother’s struggle on his brain or on a chemical imbalance. The biggest struggle that my brother has is a spiritual one—a struggle that only Almighty God can resolve.